LaTanya Richardson takes a bow after the opening night performance of ‘To Kill A Mockingbird’ at the Shubert Theatre on December 13, 2018 in New York City. Scripted by award-winning writer, producer and director Aaron Sorkin (The West Wing), produced by Hollywood heavyweight Scott Rudin, and directed by Tony winner Bartlett Sher, it’s hard to imagine any actor reluctant to take part in the reimagining of Harper Lee’s Pulitzer Prize-winning tale of racism and injustice in Jim Crow-era Alabama. But as Richardson Jackson recently told The Glow Up, she initially had no interest when asked to return to Broadway in the role of Calpurnia, maid and nanny of the fictional Finch family. Speaking with Richardson, she tells me it’s authenticity that makes her version of Calpurnia more dimensional than any prior. 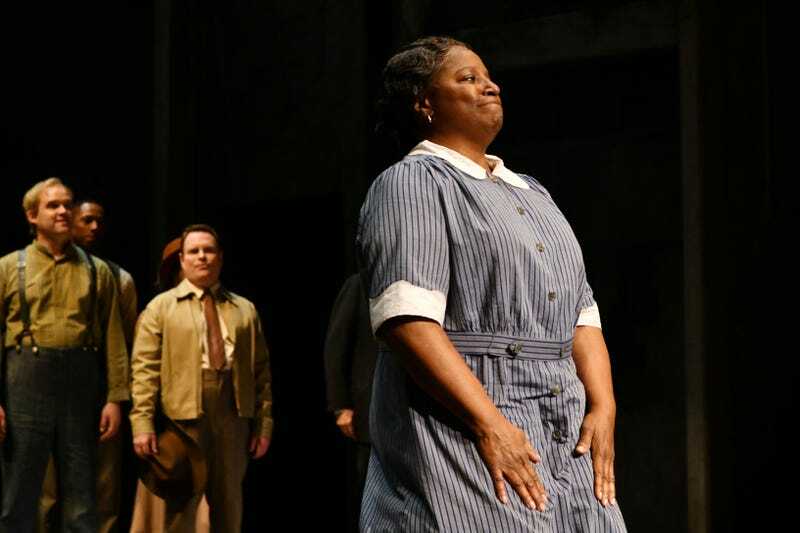 Finding Calpurnia’s wholeness and humanity were paramount to Richardson Jackson in her portrayal, which she says was in part inspired by her own grandmother. LaTanya Richardson attends ‘American Son’ opening night at Booth Theatre on November 4, 2018 in New York City. Like the slave narrative, it’s a sticking point that has repeatedly arisen in Hollywood, as the painful history of black women being relegated to roles as maids and mammies remains all too fresh (roles that unfortunately historically paralleled many of our real-life options). In recent years, some have sought to distance themselves from that history; even Viola Davis, who was an Oscar nominee for portraying a maid in The Help, has expressed regret over the role. As the great-granddaughter of a retired domestic worker that I knew and loved, Richardson Jackson and I briefly bonded over our desire to see those narratives given dignity and worth, too. We both grew up in homes that held (or even still hold) remnants of that legacy, whether as antique hand-me-downs from white employers or simply the seemingly tireless care our grandmothers took in tending to their own families and homes in addition to the homes of others. “Understand this: we still should play maids, because that is part of who we are; that is part of our quilt of living, and there is nothing wrong with that,” Richardson Jackson affirmed. “The fact that those jobs existed and women stepped into them and did the job so well is what we applaud, because they helped raise most of the communities that run this country. So, that’s not a job to be demeaned. In workshopping the role, Richardson Jackson encouraged Sorkin to write Calpurnia as a woman in full, sneaking in hints about the character’s family life and religion that had gone ignored prior. LaTanya Richardson Jackson attends the American Theatre Wing Centennial Gala on September 24, 2018 in New York City. Citing influences that range from acting titans Cicely Tyson, Diana Sands, Ruby Dee, and Mary Alice, to super-producer Shonda Rhimes and spiritual “sister” Alfre Woodard (for whom she recently stepped in at the last minute to fill a supporting role in Netflix’s Juanita), Richardson Jackson promises her next role will ensure even more of us are seen, as she shifts her focus to producing and directing, with the aim of amplifying more black women’s voices. “[Hollywood is] always trying to cubbyhole us, and we have to stop allowing it to happen,” she said. Casually, she recalls an anecdote from Obama’s presidency—you know, because the Jacksons have been known to make it onto the Obamas’ guest lists. Following a speech by the then-president, Richardson Jackson made one of her own. And while Richardson Jackson is full of ideas on how to continue bringing our stories to stage and screen, at the moment, she’s devoting her presence to bringing Calpurnia to life for a new generation of theatergoers.